Drywall, Paint and Floor… The end is (almost) in sight. 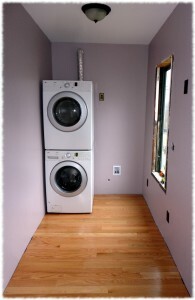 Laundry/Mud Room with the walls painted, floor installed and washer and dryer. 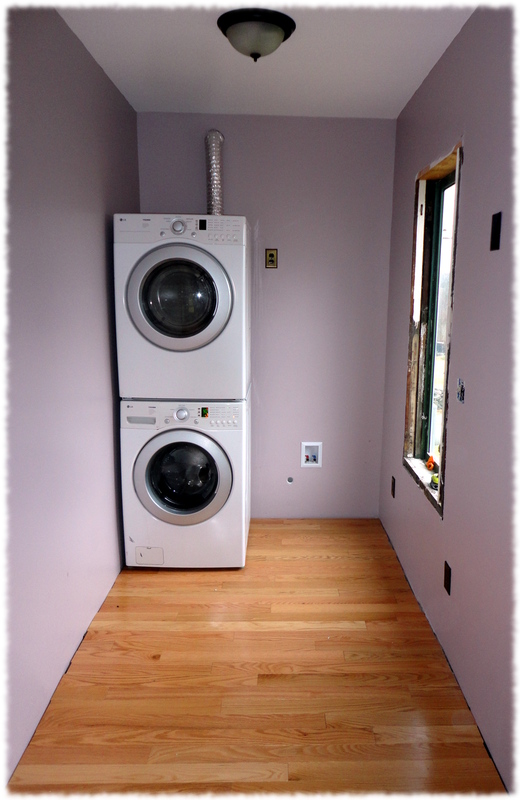 We are finally making good progress on the laundry/mud room. And of course, progress means a tired Chuck and Susanna. But it is a good tired. We had the drywall installed two weeks ago. Susanna painted the room (Queen Anne Lilac SW021 for the walls – the trim will be Classic Ivory) last weekend. We ordered the pre-finished flooring last weekend as well. This weekend the two of us spent most of Saturday installing the flooring. Lots of cutting and nailing, but we made it. I finished the last three rows this morning, and stacked the washer and dryer and installed temporary lighting while Susanna painted the back door. It is finally starting to look like a room. I’m starting to believe that we may have the room done enough for our New Year’s Eve party. I’m planning to install the trim next weekend – it will require making new window sills (or repairing the old ones). Susanna is working hard at finishing the window sashes for that room. Eventually I’ll put a sink and cabinets next to the dryer and build cubbies/organizers for the mud room portion of the room. But not before next year.